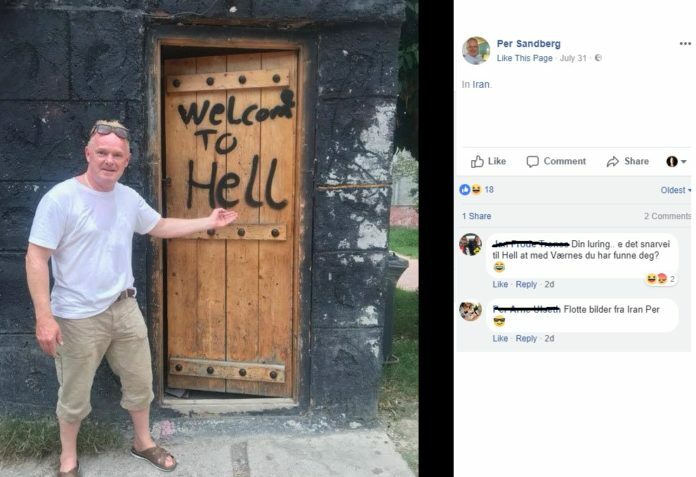 Norway's Fishery Minister Per Sanberg shared his private tour in Iran with his girlfriend. Norway’s Fishery Minister Per Sandberg’s relationship and vacation with former Miss Iran (28) create controversy and potential security risk. FrP’s leading politician and fishery minister of Norway Per Sandberg is on holiday in Iran with Bahareh Letnes. She stayed in Norway as an asylum seeker in 2008. Letnes has come to Norway from Iran at the age of 16 and was forced to return to Iran after three rejections of the asylum application. Then she has been taken back to Norway based on the danger of forced marriage and as a minor. Letnes has also represented Iran several times in various beauty contests, including Miss Iran 2013 , Miss Globe Iran 2014 and Miss Grand International Iran the same year, according to Dagbladet. Letnes states that she works on Iranian-Norwegian relations and owns two companies. Her second company has been established in January this year, and specializes in import and export of fish and gas between Norway and Iran. That is exactly the same area which Per Sandberg is particularly responsible in the government as fishery minister, writes Dagbladet. The Norwegian intelligence service- PST has previously warned that Iran is conducting intelligence against and in Norway. The Iranian regime is carrying intelligence activities by tapping visitors’ mobile phones and laptops for information, investigating hotel rooms and using so-called honey traps with female spies. Official visits both ways are diplomatically sensitive. Nevertheless, the officials in Norwegian government and Sandberg’s closest advisors were unaware that the Minister of Fisheries planned to travel to Iran for holiday with a friend. They learned about the minister’s whereabout after the Iranian embassy in Oslo contacted the ministry for a formal meetings with Sandberg in Iran, according to NRK. – Maybe I have been on holiday at a controversial travel destination for many. But more and more open their eye for Iran, maybe one of the most misunderstood country in the world. Tourism to Iran is increasing and it is very rich with its culture, beautiful nature and thousands years traditions. The minister’s visit was found ironic by Norwegian media and on social media. Per Sandberg recently suggested that asylum seekers in Norway should not longer be allowed to travel on holiday to their home countries. Norwegian politician for the Progress Party, Sandberg is also known as one of the most fierce opponent of immigration in Norway. In 1997 he was convicted of assault against an asylum seeker. Also as an outspoken politician, Sandberg has stoked controversy on numerous occasions. In 2002 he proposed a complete stop of immigration from countries outside the Schengen Area. In 2003, Sandberg stated that “different races, religions and cultures must not be mixed” if there are to be a “harmonious society in Norway”, leading to strong reactions from other politicians. Sandberg in addition claimed to have backing for his statements from the chief of police, which caused the chief of police to strongly distance herself from Sandberg’s claims. The same year he also proposed to introduce electronic tags on asylum seekers to stop them from escaping while their asylum application is processed. In 2007 Sandberg claimed american politician Al Gore of being a “Christian-fundamentalist” and “super-capitalist who have earned over 600 million NOK on the climate cause”, according to Dagbladet.